It is time to bid Oliver and Nina a fond farewell until the next time that they grace us with their friendship and companionship. The night was wonderful and the conversation was great, with them regaling us with anecdotes about places like South Africa, Germany, Sonoma, Napa, France, Laos and Zanzibar. They are true raconteurs and world travelers, while my Bride and I are much more parochial (though my Bride did quite a bit of traveling before I met her). I would be remiss, if I did not thank them, once again for their gracious gifts of wine when they arrived. The first bottle of wine that they gave us came from their recent trip to California, and they had a chance to visit Sonoma, which is an area that we have never gone to as of yet. The bottle was Anaba Las Brisas Vineyards Carneros Pinot Noir 2012. Anaba Wines have taken their name from the anabatic wind, which is a wind that blows up the steep hills of a vineyard during calm and sunny weather. The Las Brisas Vineyards are part of the Mahoney Vineyards; Francis Mahoney is an influential contributor to the study of Pinot Noir clones in the appellation. Carneros is one of the oldest Viticultural areas of California and has the unique feature of being partly in Sonoma and partly in Napa, two of the finest wine areas in the state. This particular wine spent eleven months “sur lees” in French Oak, and a third of which were new. He just knew that I am a fan of Pinot Noir wines. The other gift was a bottle of wine that is truly Oliver, as it is a German Riesling. 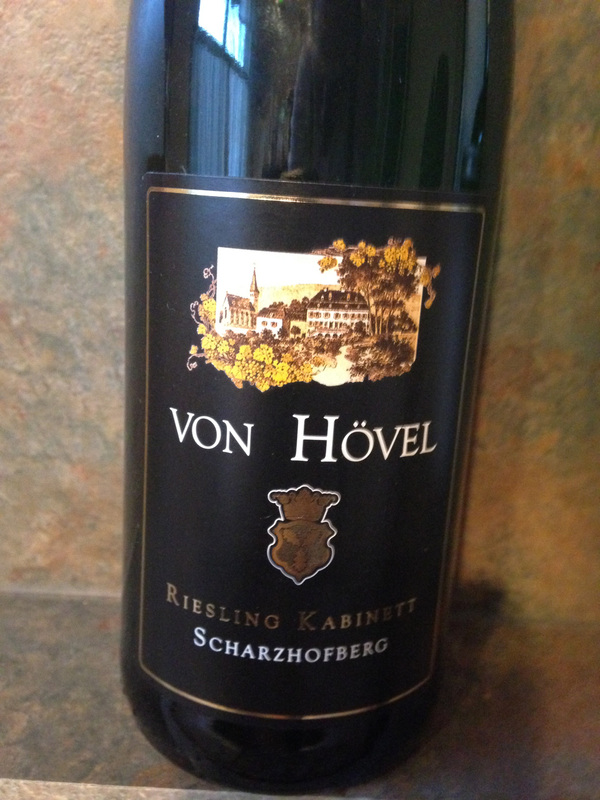 A bottle of Weingut Von Hovel Scharzhofberger Riesling Kabinett 2008 from the Mosel, and the town of Wiltingen; Wiltingen is a small but important town in the Lower Saar River area. Wiltingen has three vineyards classified as Erste Lage; Scharzhofberger, Braunfels and Gottesfuss. Scharzhofberger is the probably the most famous vineyard of the Saar and is an “ortseil,” as the vineyard is referred to only by the vineyard and not as Wiltingener Scharzhofberger. This vineyard is known for their legendary aging potential. So another wine that I can lay down in the cellar for awhile and enjoy at a later date. Once again, thank you Oliver and Nina. This entry was posted in Wine and tagged Anaba Wines, California, Carneros, Erste Lage, Germany, Kabinett, Las Brisas Vineyards, Mahoney Vineyards, Mosel, Ortseil, Pinot Noir, Riesling, Scharzhofberger, Weingut Von Hovel, Wiltingen. Bookmark the permalink. I am glad to hear that, and I think that I shall allow mine to cellar a bit more, though one never knows.